Certified Crop Advisers (CCAs) in California and Arizona have the opportunity to register for the August 5, 2016 CCA Exam until June 24, 2016. The exam will be given in Sacramento, Tulare, Ventura and Yuma. Registration for the exam is available at: https://www.certifiedcropadviser.org/exams/registration. More than 1,000 active CCAs in California and Arizona are playing an important role assisting growers with the efficient and environmentally sound use of fertilizer and crop management. Many California CCAs recently completed the University of California/California Department of Food and Agriculture Nutrient Management Training Course which qualified them to complete grower nitrogen management plans that are or will be required by the various California Regional Water Quality Boards. “Crop consultants are encouraged to become CCA s to show that they have the commitment, education, expertise, and experience to make a difference in a client’s business,” said California CCA Chairman, Fred Strauss, Crop Production Services. “The CCA certification is largest, most recognized agriculturally-oriented program in North America. The CCA Exam Preparation Course, scheduled in Sacramento on June 24, will help candidates prepare for the test. Registration for the exam prep course is available at https://capcaed.com/june-24,-2016-ca-cca-exam-preparatory-workshop. For more information on the California CCA program, go to: www.cacca.org, or contact Steve Beckley at (916)539-4107 or steve.beckley48@gmail.com for more information. The California CCA Program is also on Facebook. Cal Ag Today recently caught up with Justin Dutra, a crop consultant in pest control for the Hanford branch of Crop Production Services (CPS) to discuss some of the crops he looks after, including, “row crops, dairy crops, cotton, nuts and tree crops. ”The staff and management at CPS are focused on providing their customers with the products and services they need to grow the best crops possible,” said Dutra. 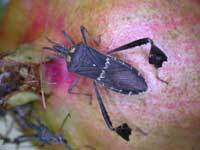 “They do this by providing an extensive selection of herbicides, insecticides and fungicides that farmers need to keep their crops pest-free.” Dutra reported the leaffooted bug is causing concern for a few growers in his region. Adult leaffooted bug, Leptoglossus zonatus. Note the two yellow spots on the pronotum behind the head, characteristic of this species. At the 40th Annual Meeting of the California Association of Pest Control Advisors (CAPCA) in Anaheim this week, Jeff Rasmussen, a pest control advisor with Crop Production Services in Kern County was recognized as the CAPCA Member of the Year. “I’m humbled, it’s an awesome feeling to be presented with an award by your peers, and they appreciate all the efforts that we as a team have accomplished,” said Rasmussen. Rasmussen is among a small group of PCAs who spearheaded the important Spray Safe program, which was created in Kern County in 2006 by a group of Kern County farmers and PCAs. Spray Safe was designed to reduce spray drift, enhance worker safety, and protect public health through more effective communications among farmers about pending and ongoing pesticide applications. “It’s the ‘Three C’s’: collaborate, connect, and commit, that has been our focus point. It’s a matter of the industry stepping up and taking responsibility, and continuing to own and protect that space,” said Rasmussen. Ultimately, according to the Spray Safe website, the goal of the program is to instill increased resolve among farmers to take every precaution necessary to ensure public safety – this is particularly so when it comes to protecting farm workers and field crews. At the heart of Spray Safe is a checklist. The photo shows Jess Rasmussen, left, and his family at the Disneyland Hotel in Anaheim, following his honor.